For the past few years, we’ve gone at least a few times a year, and I feel like we’ve finally really got a system down. I’ve honed our packing list down to what we really need without leaving anything out, and I’ve even figured out how to keep all our supplies organized while we’re home, so I thought I’d share my system with you all in case it was helpful to anyone else. First off, I keep all our camping supplies in the basement, all on one shelving unit. Most things are stored in bins, plus there are things stored in their own bags, like tents, sleeping bags, camping chairs, and air mattresses (we camp in comfort). I love having all the camping stuff together in one place, separate from the other stuff we store in the basement. When it’s time to pack for a camping trip, the first thing I do is empty the contents of the camping shelves into the garage. Then I go through each bin to make sure everything is there. I have a master list, organized by bin, that I keep a sheet protector, so I can easily refer to it when packing or at the camp site. Each bin is also labeled with a two-sided label that has the name of the bin on the front and the contents of the bin on the back. This makes it really easy to double-check that we’ve got everything, and that nothing is missing (like stuff we used up on a previous trip, or something we had to borrow from camping supplies for another purpose). As you might imagine, the Play bin is my daughter’s favorite, and it’s one of the first things to come out of the van when we get to the camp site. My favorite bin for camping is actually not a bin at all, but a 4-drawer shelving unit I bought a couple years back, specifically to organize our camping supplies. I love that it’s dark green so it doesn’t seem out of place at the camp site, since it stays out the whole time we’re camping. And the drawers make it really easy to access a lot of loose items so I’m not digging through a huge bin every time I want something small like a clothespin. I refer to this as the “kitchen” while we’re camping because it holds all the plates, bowls, cutlery, etc. The rest of the kitchen stuff in is a large bin in the same dark green that holds the bigger cooking supplies and a lot of the food. It often stays in the van while we’re camping to keep animals away from the food. wed the lines to create each section. Then she sewed a piece of grosgrain ribbon on the outside to hold it together when it’s rolled up. 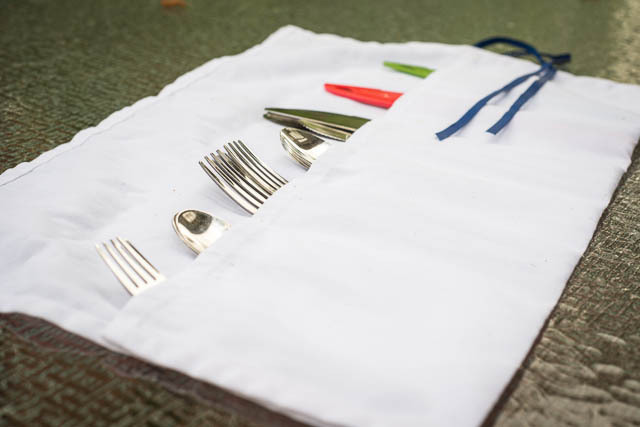 This makes it so easy to transport our camping silverware and keep it handy when it’s time to eat! And in case it would help anyone, I’ve decided to share my master camping packing list, along with a template for the labels you can modify to make your own two-sided bin labels. Click here to download it as a Microsoft Word document that you can edit, or click here to download it as a PDF if you just want to view/print it.